In fact, Kustodiyev was quite an interesting image of the merchants. He painted their portraits in all sorts of angles, under the most bizarre interiors and in various poses, naked and dressed up. It is worth noting, of course, that there are actually a lot of paintings with the merchants, but the most successful, and unique in its harmony and completeness of the image, is undoubtedly the Tea Party. Pay attention to how everything in this picture, mainly due to only its image, harmoniously intersects one another. On the balcony, at the dinner table, sits a dressed-up, simply huge, fat size merchant, with a table full of treats. In this picture, the image of the merchants, completely beaten by themselves, and carries a great semantic load in the picture. Small small nuances that give integrity to the image and completeness of the picture. Like for example a cat who rubs on the big shoulder of the hostess, but she is unshakable. Behind her big back is a beautifully depicted city, with churches and malls. 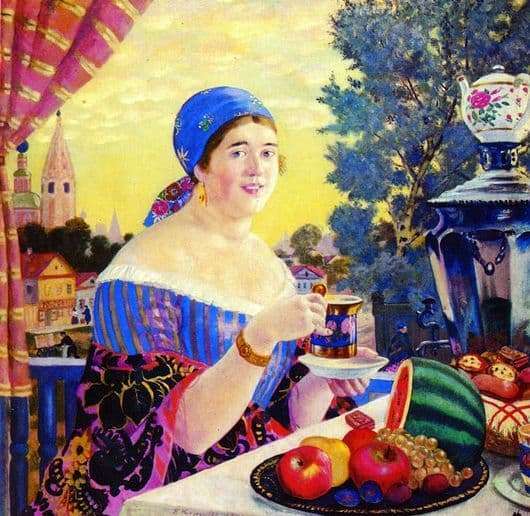 And this unthinkable still life of all kinds of bakery products, unprecedented for a simple inhabitant of that time, tea is poured into fine china, and in the center of the table stands a handsome samovar and oddly enough – a watermelon. At the time of painting, there was a terrible famine and ruin, so this picture is just a cry from the heart, it is a dream that he embodied on the canvas. Kustodiyev tried to show the essence of the merchant, with a certain amount of irony. All his paintings are notable for their cheerfulness, and a share of healthy optimism. An excellent attempt to ridicule and show us one day out of a thoughtless, but well-fed, sometimes even too much life. There is nothing superfluous, the whole picture is described quite accurately, a good combination of colors and two plans, front and rear respectively. Accessibility and ease of understanding this picture is amazing, the artist gave the maximum.